I scooped these from the shop. 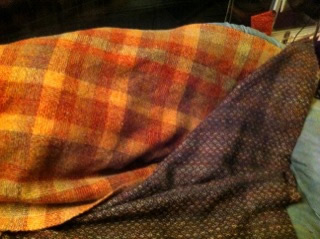 The darker handwoven blanket somehow went un-noticed on consignment for a month at the shop before I noticed it. Washed from fleece in the grease, dyed, carded, spun and then woven and some fulling. Four of these blankets now keep 2 homes warm with the hands of love. After Martina's first four blankets sold, we found out she has more! The orange, log cabin style, heavily fulled is a dream to lay under in the cooler winter nights. The kids and the cat can also be found curled up in either blanket. These are blankets that I have not seen of such complexity and richness that can only be achieved by the hand of a human.